Communication is important in all walks of life, and especially so in the world of business. As an SME it’s vital that you remain in regular contact with customers and clients, updating them on their business dealings with you and your company in a professional and timely manner. It’s also key that you stay in constant communication with your staff, ensuring that they can talk to you about anything and everything within the office, on the move or while working remotely from home. 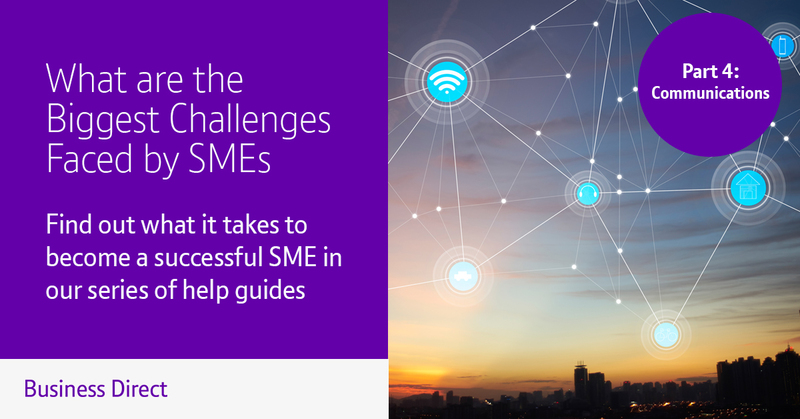 Over the past few weeks we’ve looked at various different challenges faced by SMEs ranging from budgeting and financial planning through to storage and security and, most recently, software. In the latest edition we’ll talk you through the communications challenges faced by businesses and how to get it right. Communication is one of the most important considerations for an SME, both internally and externally. Remaining in regular contact with your clients and customers is important for the reputation of your brand and to maintain that relationship, enabling people to contact you whenever they need help or advice or for you to be pro-active by reporting any positive (or negative) news. When businesses talk about communication one of the most frequently discussed elements relates to conferencing. Should you have a video linkup? Should you just have a hands free speakerphone on a boardroom table enabling you all to speak clearly? The options at the end of the day are down to the size of your business and the budget available – at both ends – but it goes without saying that you should be arranging weekly, fortnightly or monthly calls with your clients so that you can all stay on top of what is going on at each end. There are a number of great business telephone systems available catering to all needs and budgets, from Ethernet-connected desk phones with digital displays connected to your computer, through to speaker phones that are perfect for the all-important boardroom discussions with crystal clarity. Internal communications are every bit as important, especially when you have people working remotely. Tools such as Skype and Slack have grown in popularity in recent years as people can chat, share files and provide updates without having to be in the office so that reports can still be compiled and important documents sent over before the deadlines. The one flaw to internal communications is that it can bring an end to workplace conversations, making the office feel very stale at times. If employees are having their own discussions in the office over these systems – which is no bad thing – then it can take some of the noise out of the workplace, something that a lot of SMEs need in order to build working relationships and to show that sense of togetherness when clients visit. Some employees work better this way, however, with quieter surroundings giving them the ability to focus on the tasks at hand so they can produce their best work on time, every time. As the business grows and you start to take on more staff you’ll soon discover these different working patterns, and what works best in your workplace. If you never try, you’ll never know! In the next edition of our SME guide we’ll be looking at how staffing and employee morale can be a challenge and how to resolve issues – or to prevent them before they arise. Come back to the Business Direct soon to find out more.